The flames burned a whopping 230,000 acres by Sunday evening. One week after it started, the massive Thomas Fire continues to burn out of control in Southern California. The flames burned a whopping 230,000 acres by Sunday evening. As CNN points out, that's an area bigger than New York City and Boston combined. 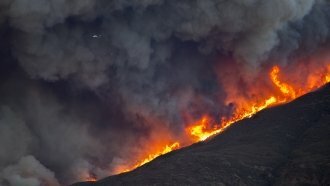 The Thomas Fire is now the fifth largest blaze in modern state history. And experts fear it could get even bigger in the coming days. Forecasters say the winds that helped fuel the fast-moving fire will let up a little this week. But conditions will remain dry, and it doesn't look like the area will see rain anytime soon. As of Sunday evening, only 10 percent of the Thomas Fire was contained. Hundreds of structures have been damaged or destroyed, and thousands of people have been forced to evacuate their homes.